The Amazon Rainforest has become a breeding ground for strange interactions between international oil companies, conservationist scientists, and indigenous activists. 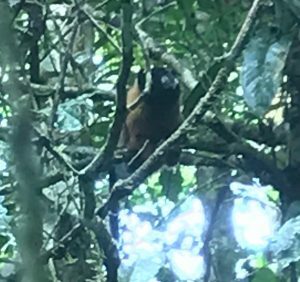 In the Yasuní, the largest national park in Ecuador, this all comes to a head around the practice of hunting monkeys, making this buggy-eyed fellow I saw a symbol of complex social, cultural, and economic conflicts that, at their worst, have escalated to something like war. It all started with the three indigenous communities that live in the Yasuní. The southernmost tribe has never been contacted, so all I can tell you about them is that they exist. The Quichque are the most integrated into mainstream Ecuadorian society, being the largest linguistic group after Spanish-speakers, whereas the Waorani were only contacted around seventy to eighty years ago. Oil companies began to arrive in the sixties and were…, we’ll say, unpopular with the local indigenous communities. They intentionally polluted rivers with toxic water (which was legal, for some reason), deforested valuable territory, and brought with them a host of indirect, but equally devastating, consequences for the environment. This led to widespread protests that often became deadly for those challenging the oil industry. Eventually, the oil companies learned that—in the case of the Yasuní—it was more cost-effective to give in to occasional demands by the local community. One such concession given to the Waorani was a free bus that connected the local community to a nearby city with an airport, giving them access to sell their goods around the world. This, in turn, created an incentive for the Waorani to increase the scale of their hunting. Expeditions that once returned with one or two monkeys to feed a family suddenly began killing as many as twenty at a time with the hopes of selling them on the world market. Of course, the oil company could simply have banned the trafficking of animals on their bus from the start, but that would imply a certain degree of concern for the local community and natural environment. This change is concerning for the scientists living at the Tiputini Biodiversity Station in northern Yasuní, where I stayed with my program. Although the researchers strongly believe in indigenous communities’ right to hunt—the land was theirs first, after all—their studies suggest that this increased level of hunting is not sustainable. Not only could it lead to the extinction of local species, but also a decrease in food sources or radical changes to the local ecosystem could be devastating to the Waorani’s local economy. The Tiputini scientists (several of whom are American) spoke condescendingly of the Waorani, who they characterize as unwilling to accept scientific fact, when explaining this situation to me. I didn’t have much of a chance to evaluate their perceptions for myself, but I personally suspect subtle racism may be at play here, and I imagine the situation is more complex than simple stubbornness on the part of the Waorani. Given this history, a simple photo of an Amazonian monkey now brings with it a host of complex questions. Does the race of the monkey’s killer make a difference? If I characterized this question as comparing an oil company killing a monkey through deforestation to a Waorani man hunting it to feed his family, I think many would say it does. When the comparison is between Waorani hunting to survive and those hunting to sell, however, things suddenly don’t seem so easy. Questions of nature and conservation are always complex, and it seems that on small scales like these they only become more difficult to understand. 2 Comments to "﻿You probably care about the race of this monkey’s hunter more than you think you do"
Great explanation of survival, deforestation and the greed of oil companies. Seeing this first hand must have been educational. The survival of the human race and survival of our planet has become a more complex issue and will continue to be more complex. Our planet is sending us warnings that we do not or prefer not to listen to. We can only hope that the generations after us do a better job.